I’m sharing another thrift store find makeover that I’ll be using in our home office/craft room makeover. In keeping with the peacock color palette, this Lazy Susan got a makeover using chalk paint and peacock adornments. I’m sure I took photos of the Lazy Susan before I painted it, but apparently I inadvertently deleted them. It was the same color as the card holder that got a similar makeover. This was priced at $2.99 at Goodwill. I bought it a few months ago, not sure how I would use it. 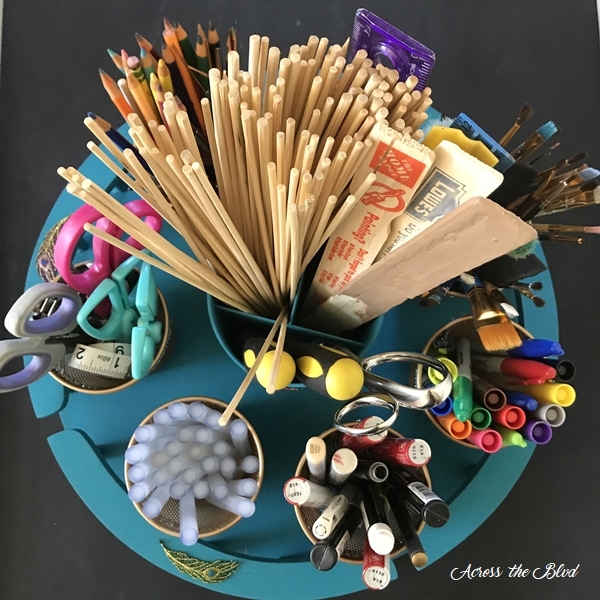 After seeing the DIY Craft Caddy that Laurie from My Husband Has Too Many Hobbies shared, I knew just how I could use the thrift store find. 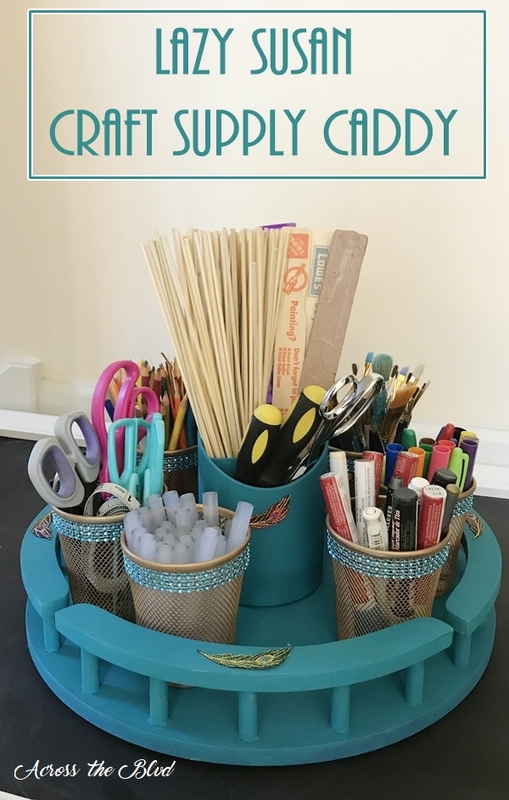 The makeover of this Lazy Susan Craft Supply Caddy was quick and easy! 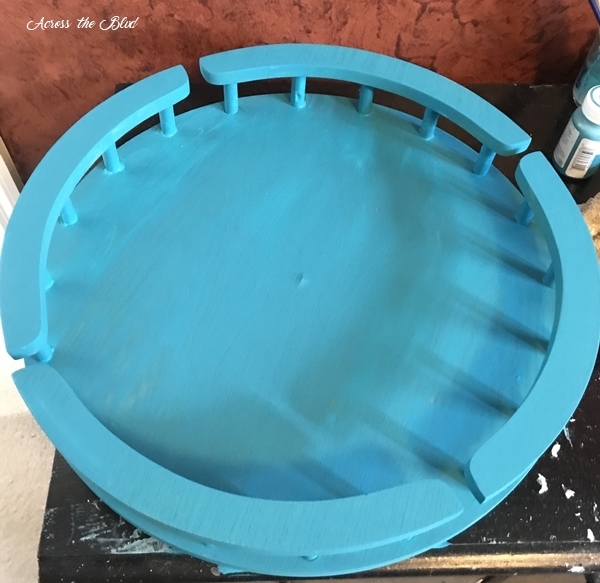 I gave the Lazy Susan two coats of Waverly Chalk Paint in Peacock, allowing it to dry between coats. 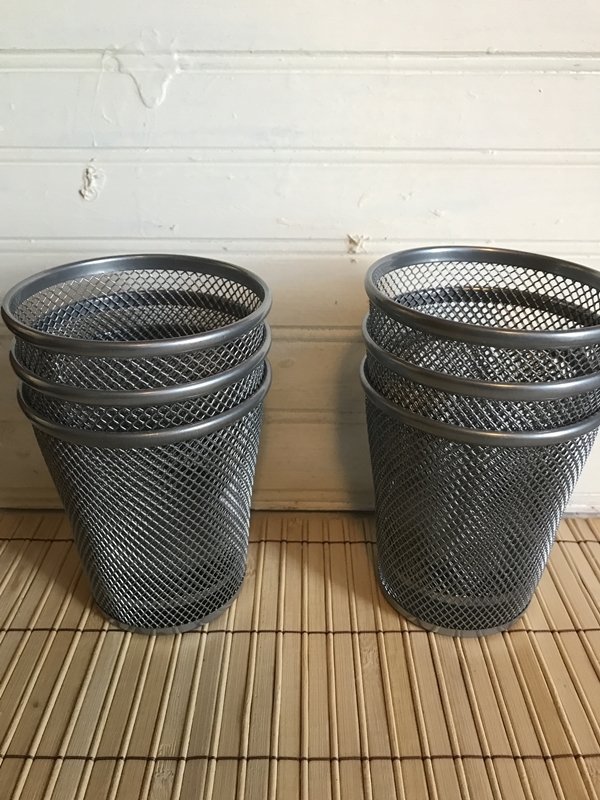 My first thought was to use glass jars, but on a recent trip to the Dollar Tree, I spotted these metal pencil holders. 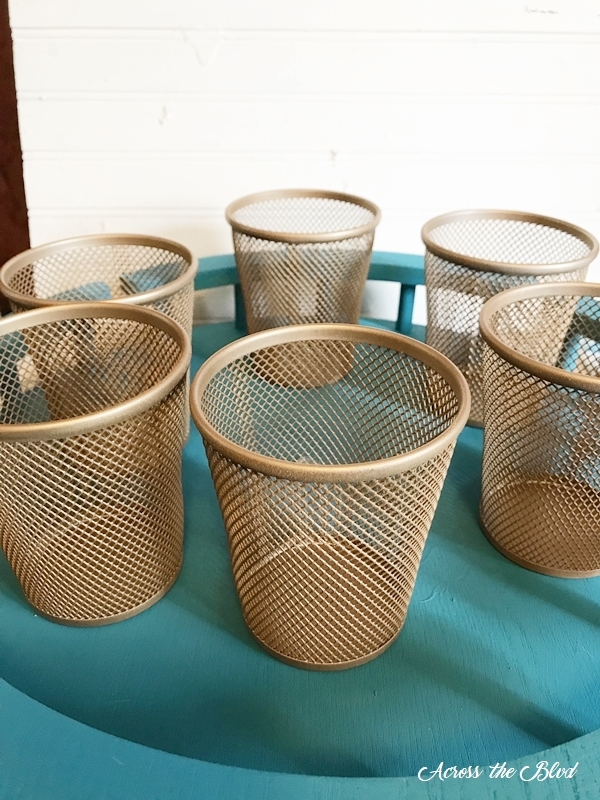 Since I’m using gold tones for my room makeover, I spray painted the containers using Krylon Premium Metallic Spray Paint. I like the color combination this gave to the caddy. To give the containers a little pop, I added a strip of jewel ribbon around each one. I found this at the Dollar Tree, too. It’s hot glued in place. I’ve had this black plastic desk container for a while. I like the size of it and it fits well in the center of the caddy. It got a two coat paint makeover, too. 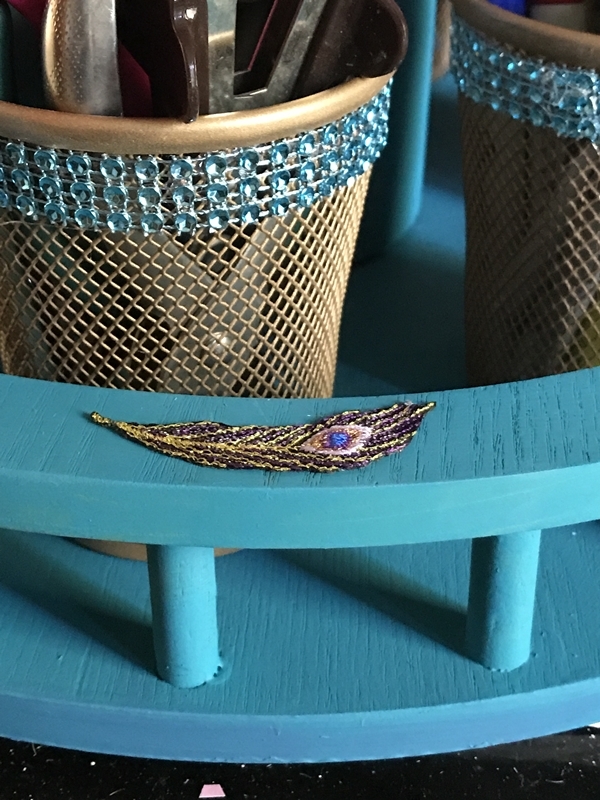 To match the card holder, I used more of the small peacock embellishments. I glued one onto the plastic container and one on each of the rims of the Lazy Susan. Putting this together didn’t take long at all. Since chalk paint and spray paint dry quickly, this was done in less than an hour. I was pleased that I found a practical use for the the thrift store Lazy Susan. It’s handy to keep supplies that I use frequently in an easy to reach spot. 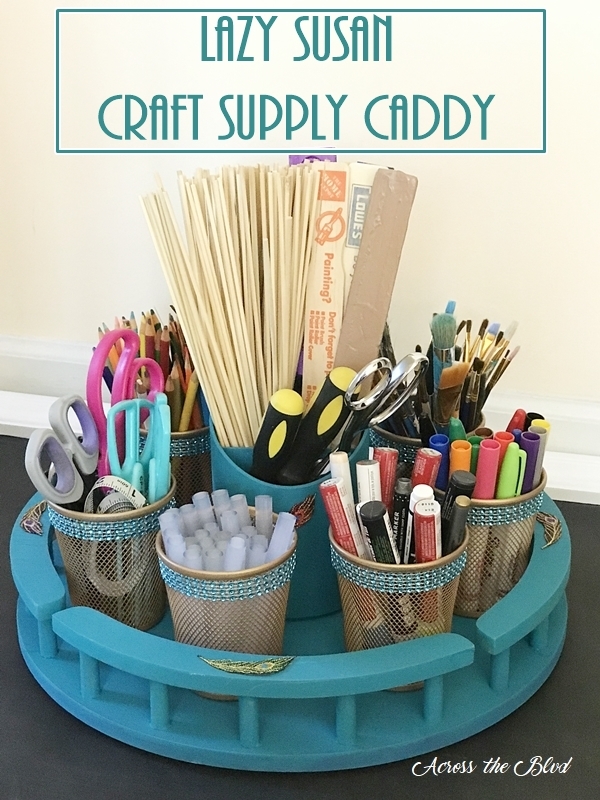 Great use of the lazy susan and will make getting to your craft supplies so easy! 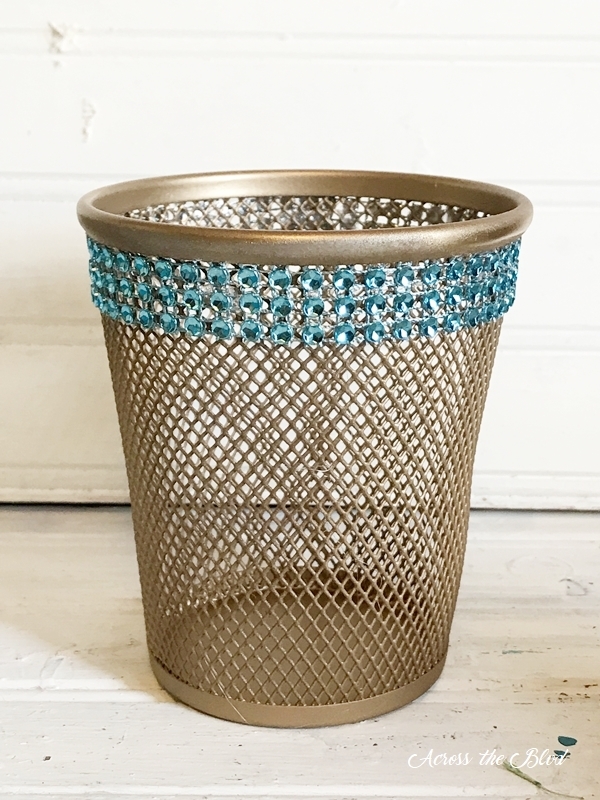 Those metal pencil holders you found are perfect and the gold color is very nice against the peacock blue! Great project! Thanks too for the shout out. Pinning and sharing. Thanks, Laurie! I like the color combination, too. You’re very welcome for the mention-it was your project that sparked this idea for me! Thank you for sharing! This is so great! My sister loves crafting and everything is thrown in a box. This solves the problem! Thanks, Patrick! It’s an easy way to have the items needed close by. What a fabulous idea! I’m always looking for a way to keep things more organized. Thank you for sharing on wonderful wednesday link party. I also like the way that you have identified the parties that you attend. I may “borrow” that idea. Pinned and shared. Thank you, Amy! 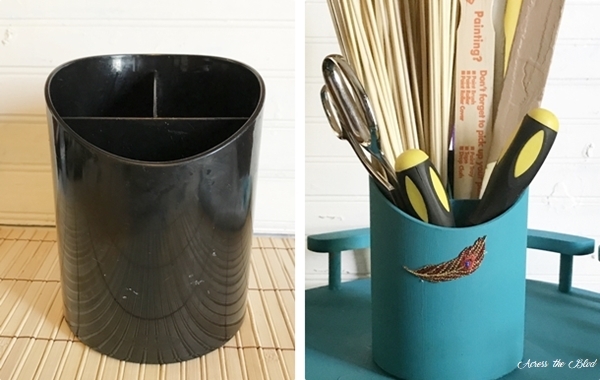 This was a quick and easy project to keep crafting supplies handy. Thanks for pinning! Don’t think anybody could say your craft supplies lazy Susan isn’t a big winner. Nice to have those little “walls” on susan to keep containers in line. love, love it. Think might just be what many of us need to attain some order and availability for our craft supplies. Wondering if either of our two $tree stores has the jeweled strips. Will be on lookout for a lazy susan.Love colors you used. This is why we grab things when we see them even if no idea what will do with item at the time. 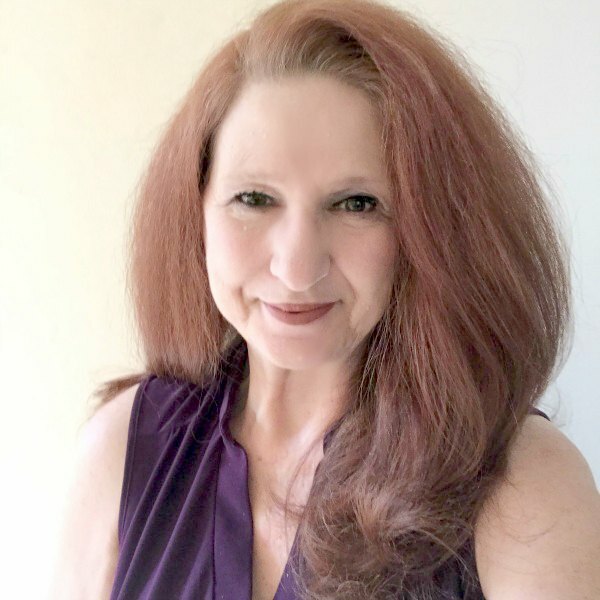 Thanks, JaneEllen! I liked the little “walls” on the Lazy Susan, too. This is definitely one of those items that I picked up at the thrift store that I just knew I could find a new use for. 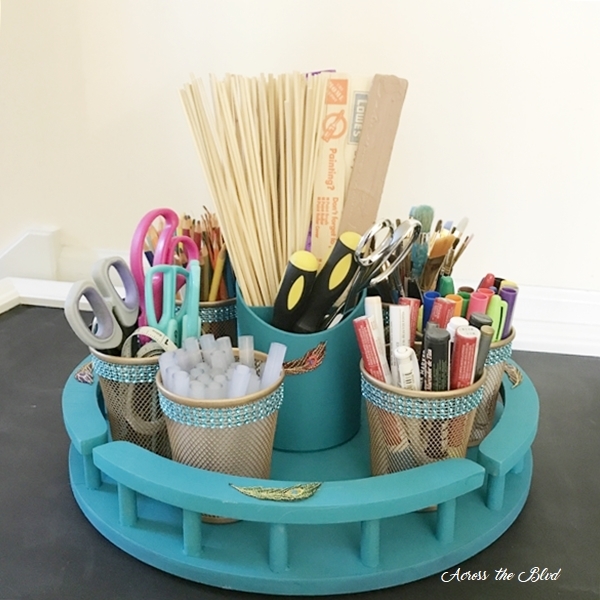 Great idea for your craft room and perfect use for the lazy susan. I am definitely going to be on the lookout for a lazy susan. Thank you, Sharon! I was pleased when I found the lazy Susan and even more so when I figured out what I wanted to do with it! Thanks! I enjoy finding odds and ends at thrift stores and giving them makeovers. Can’t beat the prices and they turn out to be one of a kinds. what a great idea! i love the colours you chose, too. I’m in the process of planning a craft room and will definitely come back to this post as a reference. Love it! Thank you, Jelica! I’m enjoying the colors, too. I’m looking forward to completing the room makeover. I hope you’ll find something that gives you an idea! Another great upcycle! I love organization so much and this definitely accomplishes it. Thank you for sharing with us at funtastic friday. Pinned & Sharing! Thanks, Angie! I love having ways to keep crafting items organized and easy to find. Thanks for the party and the shares! What a super up-cycle! I love the colors and the touches of ‘bling’. Your caddy brings order and attractiveness to your creative space. This is a great idea! I need something like this in my craft room. My drawers and closet are overflowing, so this would definitely help clear up a little space. Thank you, Amanda! It’s handy to have these crafting items close by. My craft closet is on my to do list for the room makeover. Thanks for the party! This is one glitzy craft caddy! I love the bling and will be on the lookout for a lazy susan when i go thrifting. Thank you for sharing with us at Celebrate Your Story, and have a great weekend. Thanks, Sandra! I love the pops of bling, too. Thanks for the great party each week. Hope you have a wonderful weekend. I could use this idea just on my desk! 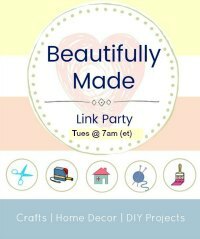 thanks for sharing at #blogginggrandmotherslinkparty i’m going to make one for myself. It’s going to come in handy once I get this room completed. I’m glad to have given you an idea, Sue! Very, very nice! It looks perfect on the desk. 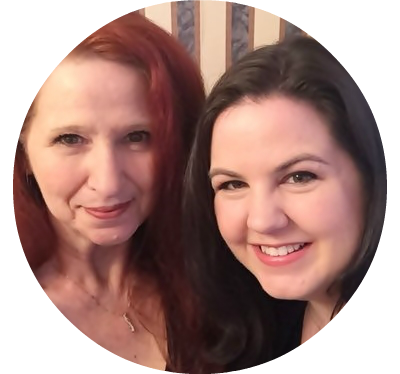 I’ve pinned and shared! Thank you for sharing at #BloggingGrandmothersLinkParty. Thanks! It’s handy to have the supplies close at hand. Thanks for the party and the shares, Teresa. Thank you, Lori. Thanks for hosting the party!